A few pictures of the two castles that are to be found in Cardiff together with a potted history. I can't claim 100% accuracy for the history. As though in some alpine setting, the sharp pointed turrets of Castell Coch - the 'Red Castle' - peep above the beech woodland on a steep hillside overlooking a gorge in the lower Taff valley. Brimming with imagery, it is a truly astonishing construction, a combination of nineteenth-century Gothic fantasy and timeless fairy-tale, one of the most Romantic if equally unexpected buildings in Britain. As it stands, the castle is the product of two fellow enthusiasts hopelessly in love with the Middle Ages. The aristocratic patron was John, third marquis of Bute; his architect was William Burges. Even before they turned their attention to Castell Coch, Bute and Burges were already engaged in an extensive programme of building works at nearby Cardiff - where the castle offers a yet more fantastic vision of the medieval past. 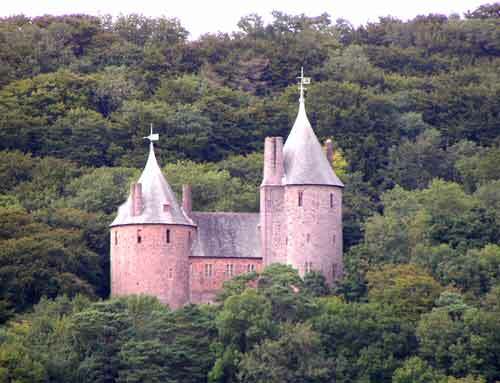 It seems that the site of Castell Coch was first fortified with an earthen motte, probably at the time the earliest Norman invaders swept into Glamorgan during the late twelfth century. The small and compact, but very powerful stone castle was almost certainly completed by 'Red' Gilben de Clare (1263-95), earl of Gloucester and lord of Glamorgan, sometime towards the end of the thirteenth century. Very little is known of the history of the medieval stronghold, though a description of the 1530s informs us that by this time it had already become a deserted ruin. So it was to remain until it came to the attention of Lord Bute in the nineteenth century. John Patrick Crichton Stuart (1847-1900), third marquis of Bute, was a man of immense wealth and one of the most remarkable figures of the nineteenth-century British peerage. In 1865, the year in which he went up to Oxford, Bute met the eccentric designer and architect, William ('Billy') Burges (1827-81). Despite their different backgrounds and temperaments, Bute and Burges found they had much in common, and their relationship proved congenial as well as enormously fruitful. Soon after their meeting, the marquis commissioned Burges to advise on the restoration of Cardiff Castle, and work began there immediately after Bute came of age in 1868. 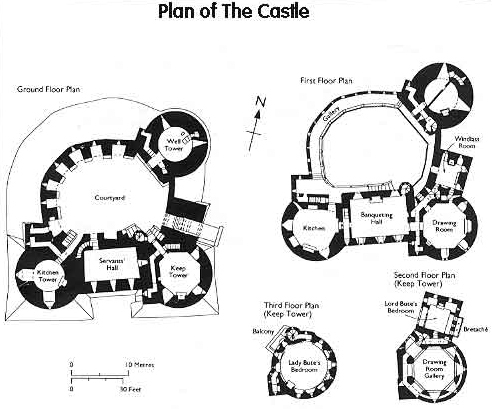 Three years later, the marquis asked his architect to consider what might be done with the ruins of Castell Coch. Burges produced a document known as the Castell Coch Report, a work of art in itself. In it, he recommended complete restoration as 'a Country residence for ... occasional occupation in the Summer'. Building began in 1875 and continued through to Burges's sudden death in 1881. Thereafter, the work of interior decoration and fitting out was completed over the next ten years under the direction of his colleagues, William Frame (d. 1906) and J. S. Chapple. Clearly influenced by continental strongholds, such as the Swiss castle of Chillon on lake Geneva, and by the remarkable work of the contemporary French architect, Viollet-le-Duc, at Carcassone in languedoc, Castell Coch it one of the greatest triumphs of the Gothic revival in the high Victorian era. But - it has to be said - apart from very occasional occupation, it was to remain something of an exotic folly. In 1950, the fifth marquis of Bute placed it in the care of the State, and since 1984 it has been maintained by Cadw: Welsh Historic Monuments. Cardiff Castle is situated in the very heart of Cardiff with the new? lodgings built in the 19th century sitting side by side with the original Norman keep which is on the right of the picture. Burges was the architect for this project also and the rooms are decorated in the romantic medieval style. Also on the site are Roman walls on which parts of the new walls have been built. The lodgings are again lavishly decorated with one room having gold nuggets set into the walls. At today's prices that one room alone would cost millions of pounds to decorate. The castle and grounds were donated to the City council and are now used for functions and outdoor events.